Millions of Yemenis are on the brink of starvation while the country is in the midst of the world’s fastest-growing cholera epidemic. Civil war, foreign military intervention, and a naval blockade have caused death and disease on a massive scale. 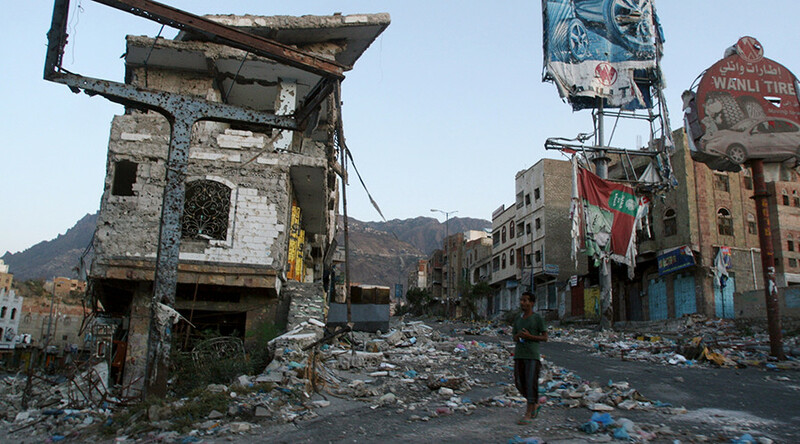 Yemen can no longer sustain itself following a prolonged and bloody insurrection and a brutal bombing campaign waged by the Saudi-led coalition since March 2015. In spite of UN warnings about extremely high collateral damage caused by the airstrikes, the US and UK continue to supply Saudi Arabia with billions of dollars in arms. The coalition of nine Arab states has carried out 5,676 airstrikes in Yemen so far this year, far surpassing the 3,936 launched in 2016. Over 4,000 civilians, including 1,332 children have died as a direct result of the fighting, while the overall death toll since the civil war began has surpassed 10,000. What began as a bombing campaign has now morphed into a naval and economic blockade which continues to this day. The destruction of critical water and sanitation infrastructure has also generated the worst cholera outbreak in the world, with more than 500,000 cases reported by the WHO. A recent analysis by a team of researchers at London’s Queen Mary University found that the Saudi-led intervention in Yemen played a key role in the cholera epidemic. “[T]he government is supported by a Saudi-led coalition, and this alliance commands far greater resources than the rebels. As a result, Houthi-controlled areas have been disproportionately affected by the conflict, which has created conditions conducive to the spread of cholera,” the researchers wrote. Renee Van de Weerdt, Chief of Emergency Management and Support at the World Health Organization (WHO) summed up the impact of such sustained bombardment during an already violent civil war in an interview with RT. “The situation is dire in Yemen. Less than fifty percent of the health facilities are operating; more than 15 million people have no access to basic health care services,” Van de Weerdt said. In addition, the WHO and other organizations are on the ground fighting to contain the cholera epidemic which has been greatly exacerbated by the aerial bombardment. In spite of this, aid workers have been successful in the affected areas to which they have access. "The numbers are indeed staggering: this is one of the biggest cholera outbreaks in recent history. [But] More than 99 percent of people that were exposed to this germ, and had access to care, survived," Van de Weerdt added. Some 80 percent of Yemen’s food is imported, and the ongoing Arab coalition siege has left 17 million people - roughly 60 percent of the country’s population - in need of food assistance. At least 6.8 million people or roughly one in four Yemenis are severely food insecure and depend entirely on external aid, reports the WFP. Saudi officials claim the security situation is so precarious that they cannot risk more arms making it into the country, even though the UN inspects every ship that aims to make port in the northern hub of Hodeida, a main supply artery for the entire country. In addition, more than three million women and children under the age of five need medical support to prevent or cure malnutrition. CEO of the Disasters Emergency Committee, Saleh Saeed, spoke with RT about the organisation's role in Yemen at the forefront of staving off the twin disasters of famine and cholera.